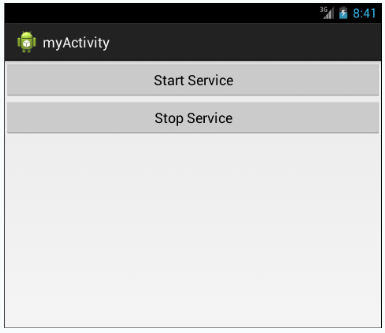 See in this article how to use services and broadcast receivers in an Android app. Mobile platforms support multitasking features, which enable simultaneous execution of multiple apps. Some of these apps require user intervention while others can run in the background without any user intervention. App components, which run in the background and perform specific tasks, are implemented in Android using services. Another useful app component is the broadcast receiver, which is used to inform all the concerned apps about the occurrence of an event, such as the arrival of an SMS. When an event occurs, the apps registered to receive the broadcasts are notified by the broadcast receivers. While developing an Android app, you would require that a task, such as playing music, continues in the background while the user is playing a game or performing some other task. Such tasks are accomplished in Android apps by using services. A service is an app component that doesn’t have any UI and can perform long-running operations in the background. Services continue running in the background while the mobile device is being used for other activities or tasks. They can be executed in a separate thread apart from the main thread and you can manage them from an app component, such as an activity. Therefore to interact with a service, you may need to create an activity. For example, you have a simple Rich Site Summary (RSS) reader with a list that includes all the new posts from a news website. A service will search for the updates by using the website, and then send those updates to a ViewNewsHeadlines activity. You can then create another activity, such as the ManageFeeds activity, to start or stop this service. Started: A service is said to be in the started form when an app component, such as an activity, starts it by calling the startService() method. Once a service is started, it can run in the background for an indefinite period of time even if the component that started it is destroyed. Typically, a service that has been started performs a single operation and doesn’t return a result to the caller component. For example, a started service might upload a file over the network. When this operation is completed, the service would stop itself. Started services receive a higher priority than inactive or stopped activities making them less likely to be terminated by the Android's resource management system. Bound: A service is said to be in the bound form when an app component, such as an activity, binds to it by calling the bindService()method. A bound service provides a client-server interface. This client-server interface allows app components to interact with the service, send requests, get results, and communicate across processes using IPC. A bound service can run till the time another app component is bound to it. More than one component can bind to the service at a time and when all the components unbind, the service is destroyed. Consider the example of a music player service. You may want to display the details of the currently playing song and also allow the user to select a song to be played. This can be done by binding the music playing service to an activity, where such details can be displayed. It is also possible to create a started service that can be bound to other app components. Such a service needs to be started, to run indefinitely, using the onStartCommand()callback method and during its lifetime, it can be bound to other components using the onBind()callback method of the android.app.Service class. Note: When a service is started, it runs within the main thread of the app that started it unless explicitly specified to run in a separate thread. Therefore, if a service is going to perform tasks which would block the CPU, such as playing music, you should run it in a separate thread to minimize the chances of errors, such as Application Not Responding (ANR) error. This would also make the main thread of the app to be available at all times for user interaction. The lifecycle of a service can follow two different paths depending on the form of the service, which can be either started or bound. To understand the lifecycle of a service, consider the example of a media player service that starts when an activity starts a service to play a music file. During the lifetime of this service, another activity may bind to the same media player service to change the music file or maybe provide an interface to the user to start, pause, or stop the music. If the user chooses to stop the music, the media player service gets destroyed and releases all acquired resources. The service stops itself by calling the stopSelf()method. Another app component stops the service by calling the stopService()method. When a service is stopped, the system destroys that service. The following figure depicts the lifecycle of a started service. A bound service is created when another app component, such as an activity calls the bindService()method to bind with the service. Once the app component is bound with the service, it communicates with the service through the IBinder interface. 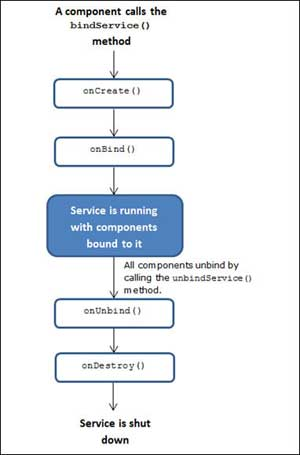 The component can unbind from the service by calling the unbindService()method. A service can allow multiple components to bind with it, as evident from the preceding media player example. A service does not need to stop itself. It is automatically stopped and destroyed when all the components that are bound to it unbind themselves from it. The following figure depicts the lifecycle of a bound service. 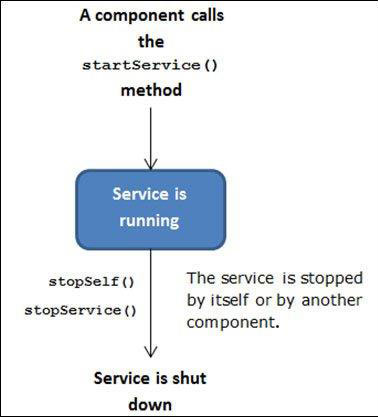 After the startService()method has been called by a component, the Android system checks if the service is running or not. If the service is already running, it calls the onStartCommand()method of the service, passing it the Intent object. 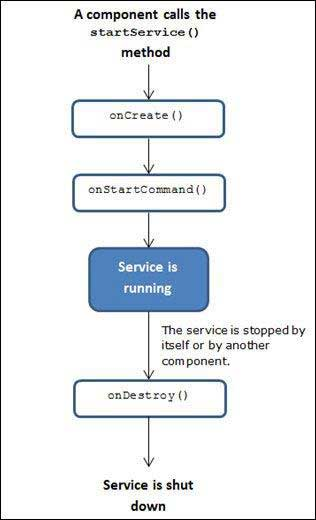 In case the service is not running, the Android system calls the onCreate()method first and then the onStartCommand()method of the service. When multiple components start the service, the onStartCommand()method is called individually for each start request resulting in multiple calls to this method. In case of a bound service, the component that starts the service can create a PendingIntent object and pass it to the service. The service can then use this object to send a result back to the calling component. Since a service is an independent block of code, it needs to manage its own lifetime. This means that until the Android platform needs to recall the memory occupied by the service, the service will continue running in the background. A service needs to stop itself using the stopSelf()method, in case it is ideal for a long time. Alternatively, a service can be explicitly destroyed by another app component using the stopService(Intent iSrvce)method. iSrvce is the service's intent. Unlike the onStartCommand()method, only one call to the stopService()or stopSelf()method destroys the service. Create a service by extending the android.app.Service class. Register the service in the AndroidManifest.xml file. Where, intent is the intent that has been supplied to the startService()method and flags provides data about this start request. startId is an integer that uniquely identifies each start request. Where, intent is the intent that has been supplied to the bindService()method. The following figure depicts the callback methods executed during the lifecycle of a started service. Figure 3: The Callback Methods Executed During the Lifecycle of a Started Service. The following figure depicts the callback methods executed during the lifecycle of a bound service. The following code snippet illustrates how to create a service and start/stop that service from another activity. Below we can see the myActivity class that contains two buttons, Start Service button and stop Service button. // Start the service defined in a separate class, myService. // Stop the service started earlier. // Call a method to perform a task . // Ensure that the service is not paused. // Perform some task such as provide updates or play music. In the preceding code, when the app is executed, the main activity is displayed with two buttons. When the Start Service button is clicked, myService gets started and runs until the Stop Service button is clicked from the main activity. The service keeps on running even if the main activity is closed and will keep on running till the main activity is executed again and the Stop Service button is clicked. The following figure displays the myActivity activity. Figure 5: The myActivity Activity. Listing 3: Code to declare all the services in config file. Note: Similar to an activity, you can declare an intent filter for a service. The system: A broadcast generated by the system announces the system-level events, such as the screen is being turned off, the battery is low, or an SMS has arrived. An app: A broadcast generated by an app announces the app-level events. For example, an app that is downloading some data may want to inform other apps that the data has been downloaded and is available for use. Another example can be of an RSS news feeder app. By using this app, you may want to inform other apps whenever a new item is available. This can be done using a broadcast receiver, which enables other apps to register and receive a notification whenever a new feed is available. A broadcast is delivered in the form of intents. To receive and respond to a broadcast, an app needs to include a component called a broadcast receiver. Broadcast receivers do not provide a UI. However, they can create a status bar notification to alert the user when a broadcast is received. Now this complete article shows how to manage the Services and Broadcast Receivers. I hope this article has clear all the conceptual complication in android service management. In Broadcast Receivers, there are two major types of broadcasts that can be received: (1) Normal Broadcasts, which are sent to all the interested receivers at the same time and the receivers run in an undefined order often at the same time. (2) Ordered Broadcasts, which are sent to all the interested receivers in a proper order, which means that a broadcast is delivered to one receiver at a time. When a receiver receives a broadcast, it can either propagate the broadcast to the next receiver or it can completely abort the broadcast so that it will not be passed to other receivers. I am sure this article will help you a lot. Lots of new technologies are coming in my next articles. Watch this space for more.